Over the weekend, I took and impromptu trip to CA to visit my family, and in the process, I made dinner for my mom one night I was there. Since she has many many more cookbooks than I do, it seemed a perfect opportunity to find something for new recipe day. And since she swears by the Greens cookbooks (as does everyone in my family) I decided to make something from one of those. 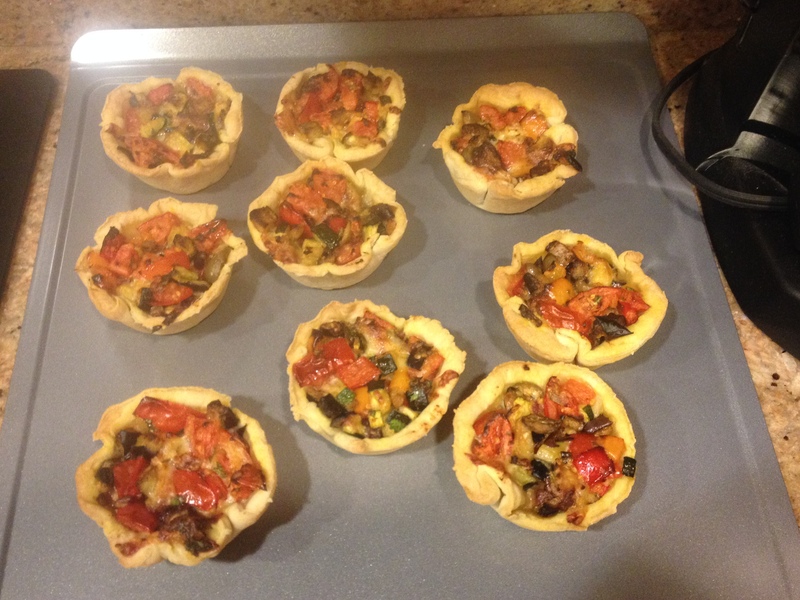 Since it was still effectively summer back in NorCal, I decided to make late-summer Provencal Tartlets. Ok, this recipe does take awhile to cook (about 2 episodes of Star Trek) and it looks like a ton of ingredients, but its pretty straight-forward to do. Dice all the veggies and stick them in a bowl. Toss with the garlic, olive oil, and dried herbs. Roast at 400 for about 10-15 minutes. The diced veggies means it goes pretty quickly. Stick back in a bowl. Roll out the dough and cut it into circles large enough to fit a cupcake pan. Then line the cupcake pan with the little dough circles. Toss the now-cooked and slightly cooler veggies with the parsley, tomatoes, and cheeses. Fill the tartlets, and then bake for maybe 30 minutes at 375 (until they are golden and the cheese is bubbly. Cool slightly and serve! Oh man these were good. Lots of veggies to be sure, but since its not a ton of any of them, it can basically be an “odds and ends” sort of filling for the tartlet. I mean, these are all pretty common summer veggies to have, and the only things I bought specifically for the recipe was the fontina cheese (fontina works amazing with eggplant as a general rule). I had this with at California Sauvignon Blanc which I thought was a good pairing. Sav. blancs are good with most summer veggie recipes, and I drink CA wines when I’m in the state as a general rule. Song of the Week: Shut Up and Dance by Walk the Moon. Another catchy pop song I rather like. My mom said it was her new favorite song this weekend, and since I enjoy it too, I figured it would be perfect for this week. While I am a confirmed atheist, I do enjoy the food aspects of holidays, religious or otherwise, from many different cultures. Besides which, my BFF and my brother-in-law are both Jewish, so I have a special place for Jewish holidays in my world. Monday was Rosh Hashanah, the Jewish new year. While apples and honey are traditional for the holiday, I decided (after consultation with my BFF) that this was the perfect reason to make challah. I love challah so much, but have never gotten around to making it myself. So finally I felt motivated enough. In a large bowl, place the warm water. Dissolve the sugar and yeast. Add 3/4 cup flour and blend thoroughly. Let the yeast mixture proof for about 15-20 minutes. Add the egg and the butter and mix those in. Then add a cup or so of flour and mix it in. Keep adding flour a little at a time while you mix and start to knead the dough, until its no longer sticky. Keep kneading til the dough becomes elastic. Cover and let the dough double in size, like an hour and a half. Once the dough has doubled in size, punch it down, and divide the dough into thirds. Roll each third into a rope of roughly the same size. Braid the ropes together (Here’s a good visual on braiding challah). Once you’ve braided the challah, stick it on a lightly-greased baking sheet and let it rise again, for about an hour. Bake at 35 for 30-35 minutes, or until golden brown, and enjoy! The recipe was awesome! 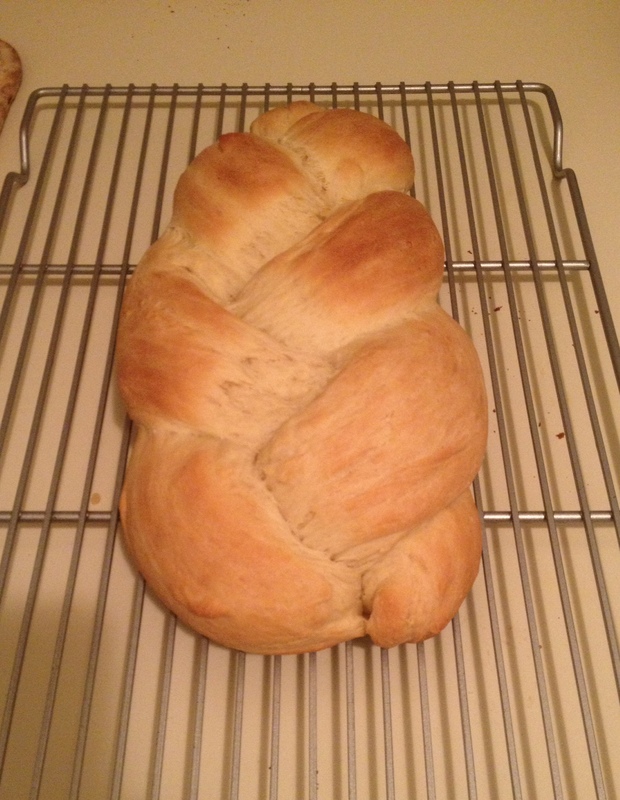 Perhaps not quite as good as when I’ve bought challah from the grocery store, but hey, it was my first try with this. I also think I’m going to try for a little less sugar next time I make this. Also there is an onion variation I now want to try as well. Since apples are a thing for this holiday, I had the challah (and the casserole I made for dinner) with hard cider. Now that it’s basically fall, hard cider is something I drink a lot. Song of the week: You’re A Better Man Than I by The Yardbirds. One of the great, under-appreciated 60s rock bands, the Yardbirds launched Jimmy Page and Jeff Beck’s careers. This is one of my favorite songs by them. So I couple weeks ago, as I had previously mentions, I had intended to bring dessert in for me and a coworker, but did not follow through. Since then, I felt mildly guilty enough that I promised myself I’d bring some in next time we worked together. 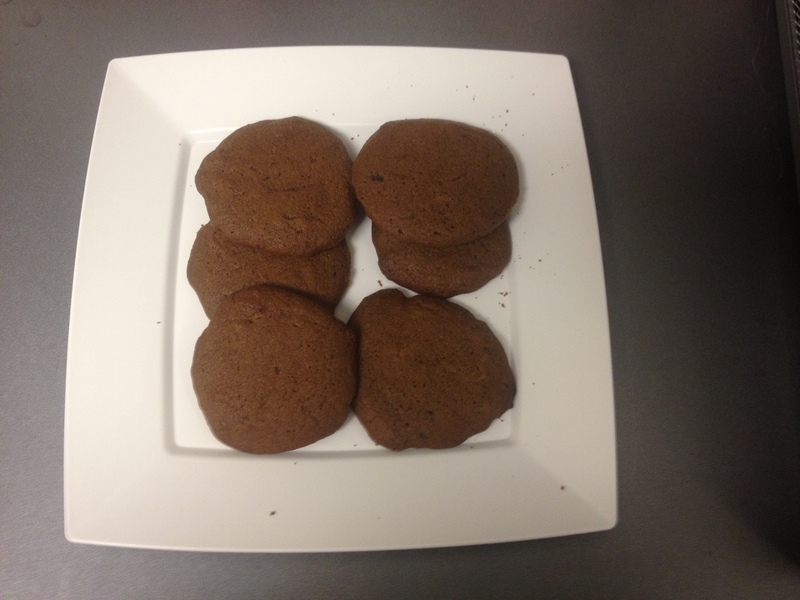 Which I actually followed through on – I brought cookies! Since it’s September, and in my mind fall has arbitrarily begun – doesn’t matter that it’s still incredibly hot out as I get to drink Oktoberfest beers – I wanted to make something in the gingerbread family. After numerous consultations with my cookbooks, I decided on ginger-molasses cookies. Cream together the butter, sugar, molasses and egg until fluffy. Add the soda and spices and mix them in. The add about 1 cup of flour. Once that’s incorporated, keep adding flour, a little at a time, until you have a soft, non-sticky dough. Plop large-ish spoonfuls on a baking sheet, and bake at 350 for around 15 minutes. These were awesome. They taste extremely similar to my favorite gingerbread cake, which was what I was aiming for, and very different from the standard gingerbread cookies one makes at Christmas (and better in my opinion). I do have to warn you, they are a little intense, so if you aren’t a fan on gingerbread, don’t bother trying these. And two of my coworkers liked them too! Song of the week: Stereo Hearts by Gym Class Heroes. A fun, enjoyable song – not earth-shatteringly good, but fun too listen to when you’re in the mood.